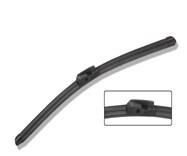 Orignal fit bracketless wiper blade , suitable for BMW 7 series F01&F02(2008 to 2011). Aero design , frameless steel backing , natural rubber.available in different sizes (from 16inches to 28 inches). Are you looking for a wiper blade supplier? Sun Rise can offer the full range of wiper blade, including the Universal stainless steel frame wiper blade, Universal Aero Flate Wiper blade, Original fit Wiper blade, Rear Wiper blade, Front wiper blade and wiper arm.